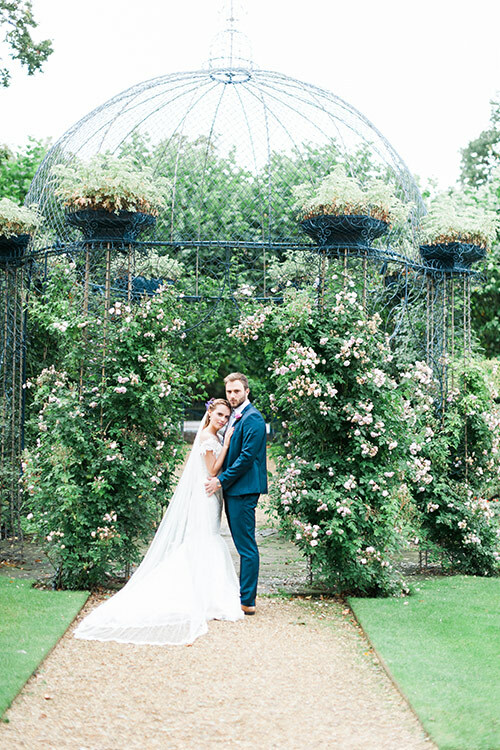 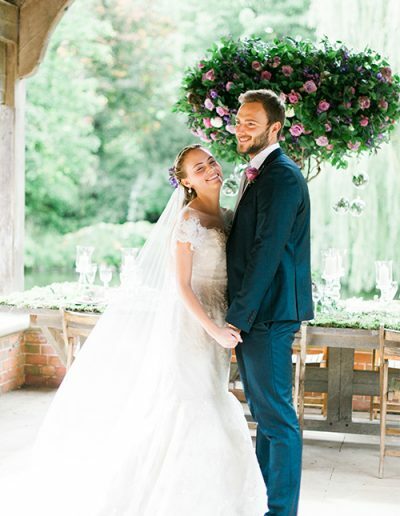 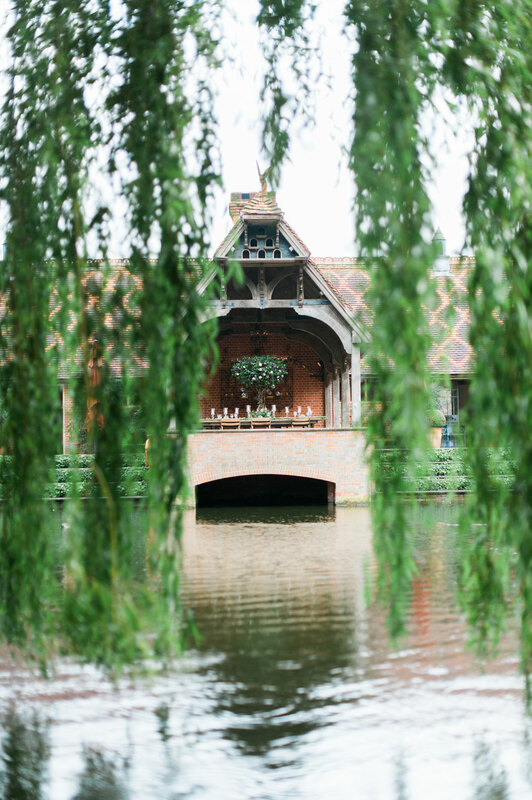 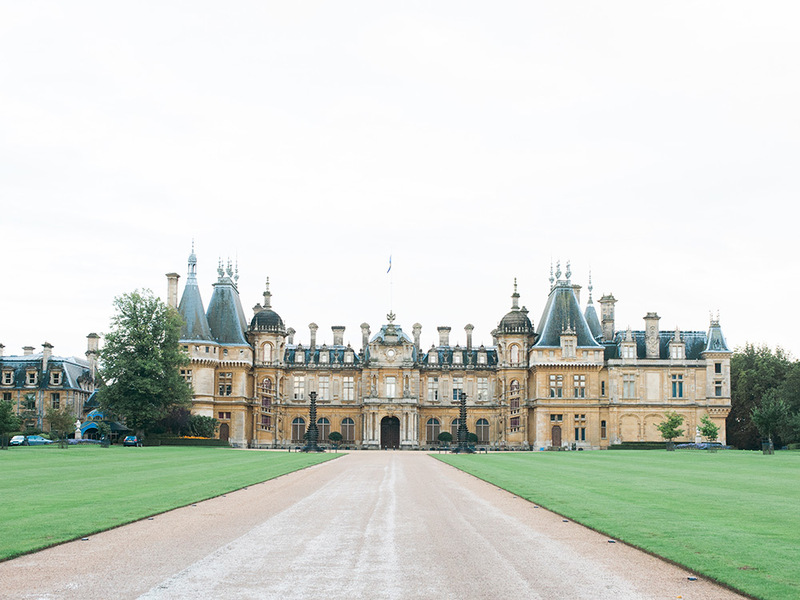 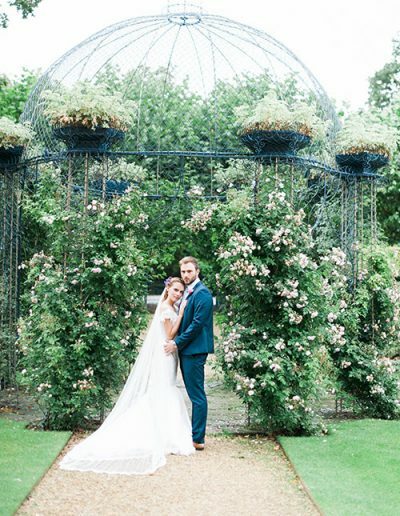 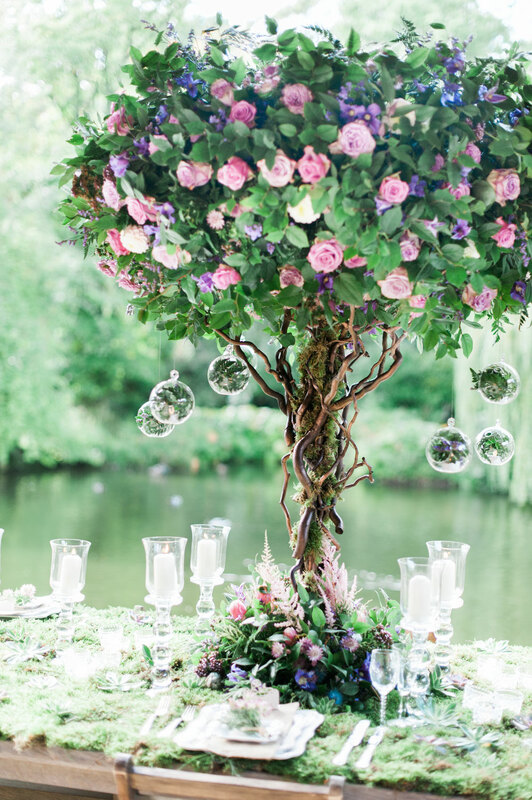 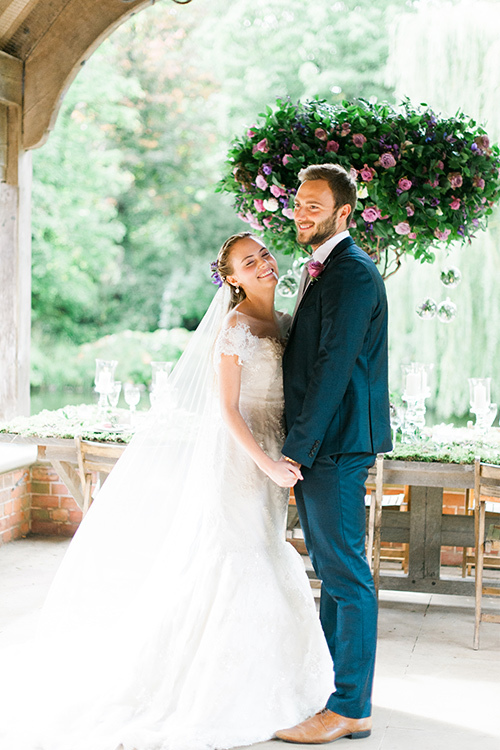 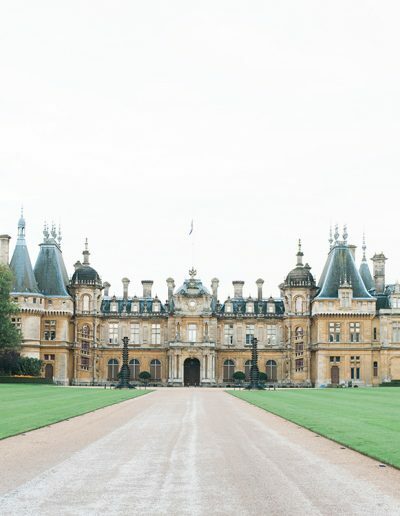 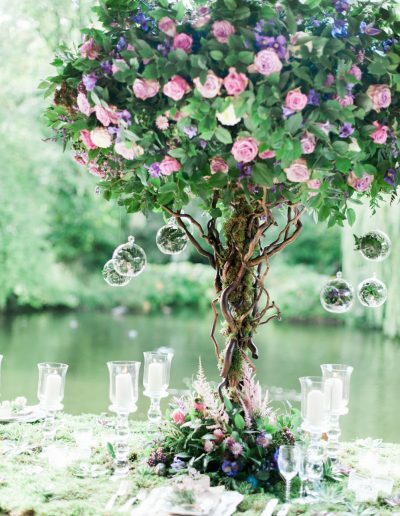 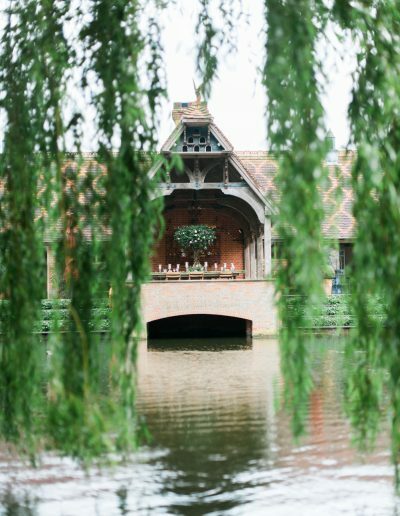 To create a whimsical and romantic woodland design, perfectly fitting to the enchanted surroundings of The Dairy at Waddesdon, Larry Walshe crafted the most magical tree from contorted willow. 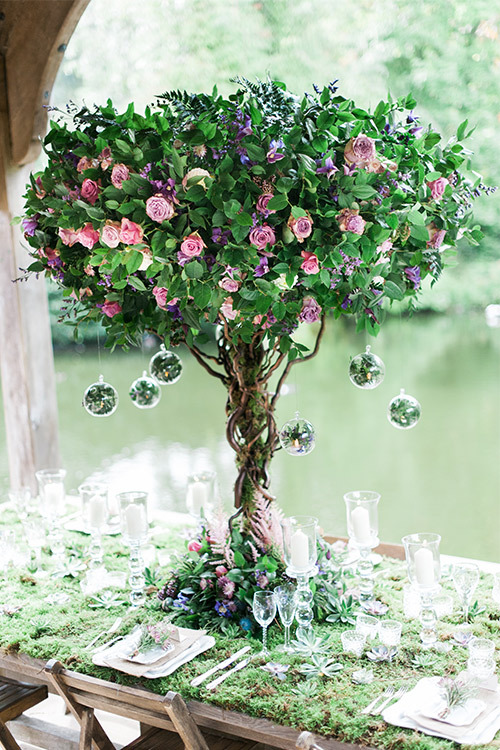 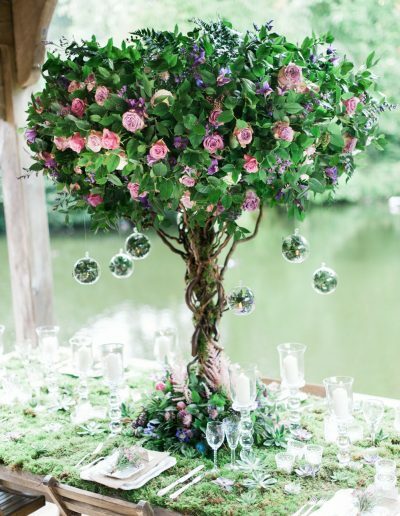 The soft pink and purple tones blend seamlessly with summer woodland foliages to create a textural abundance of seasonal delights. 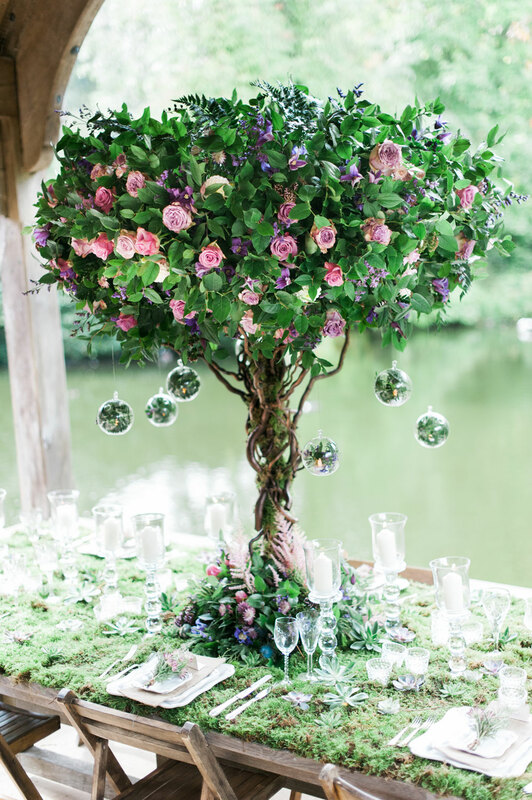 From base to canopy, this piece exudes curiosity and interest; suspended baubles add a soft, warm glow, as do the crystal candlesticks throughout the table. 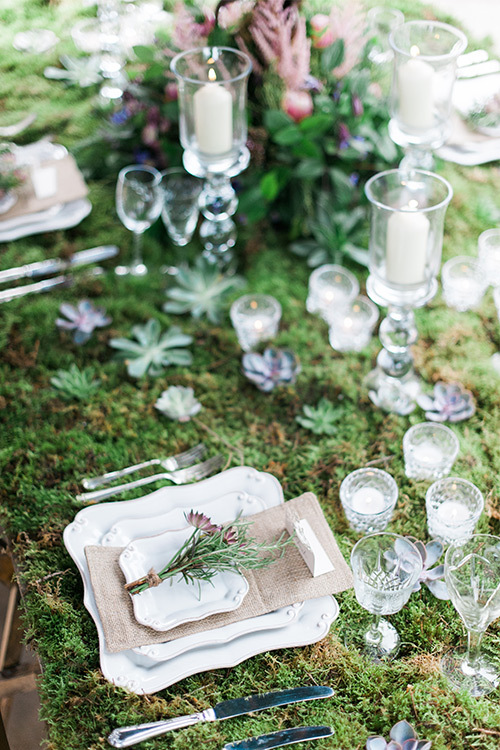 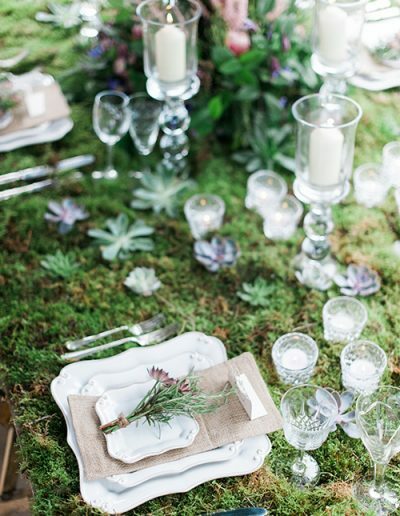 Covering the entire table with moss and succulents captures the heart of a woodland design and creates a truly unique dining experience. 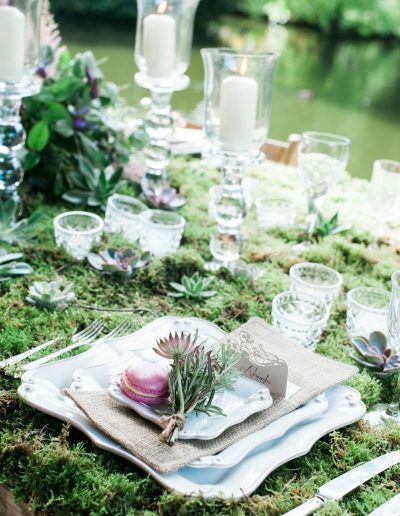 At base level, herbs including rosemary and oregano were incorporated to further delight the senses. 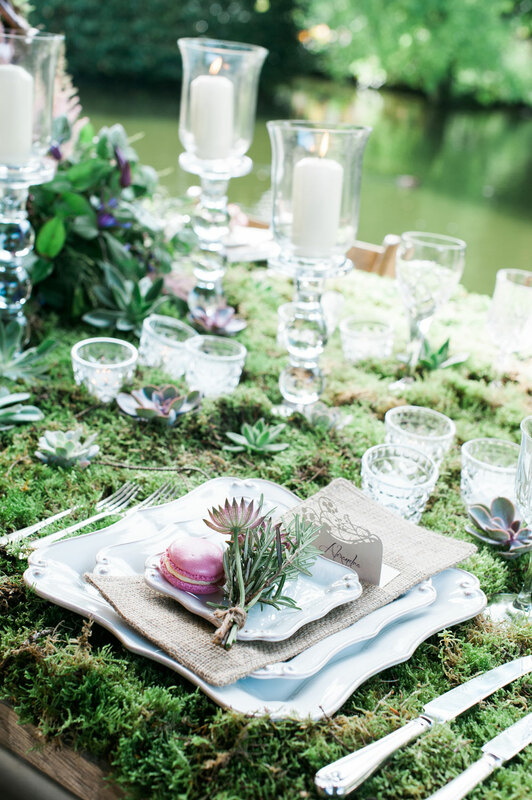 Each place setting also included a miniature herb bundle to extend the design and another layer of detail. 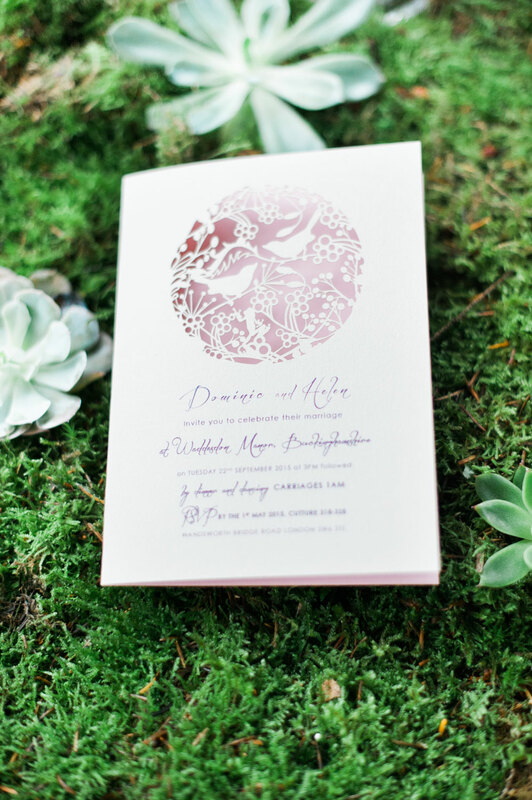 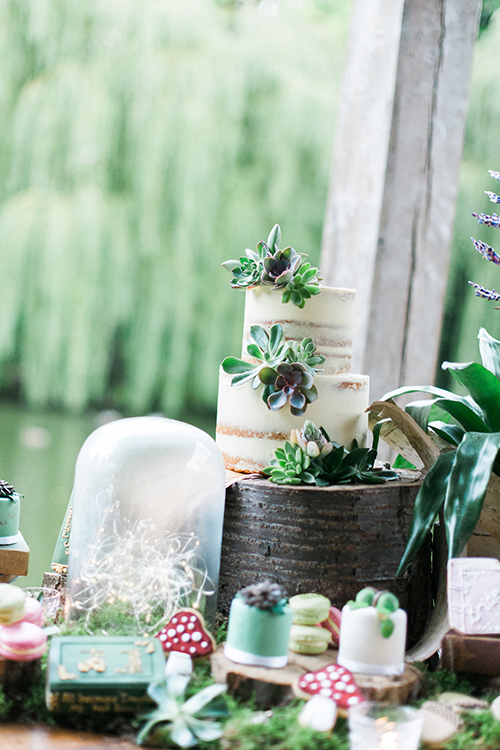 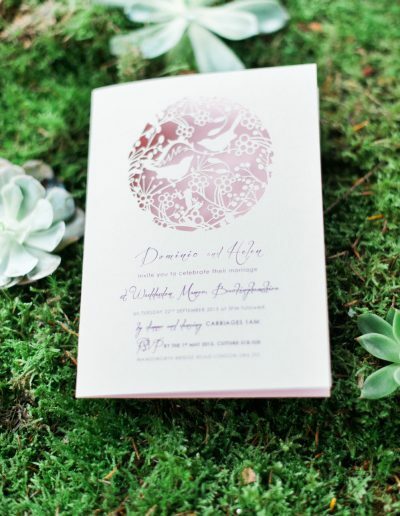 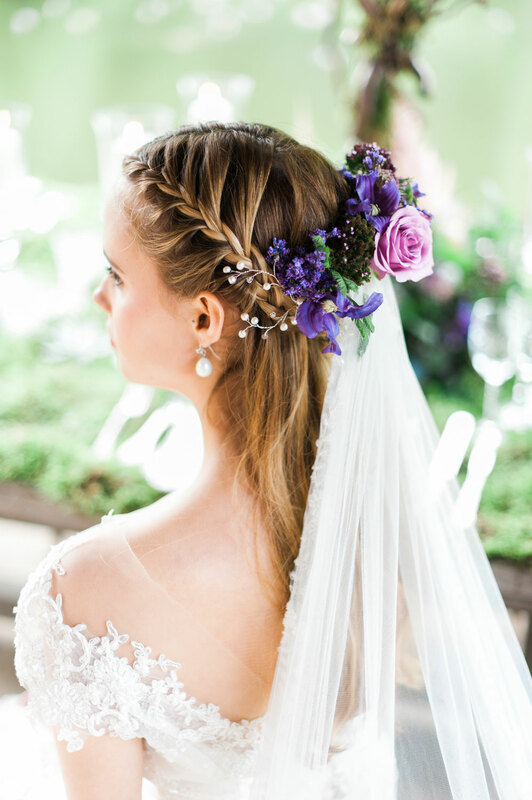 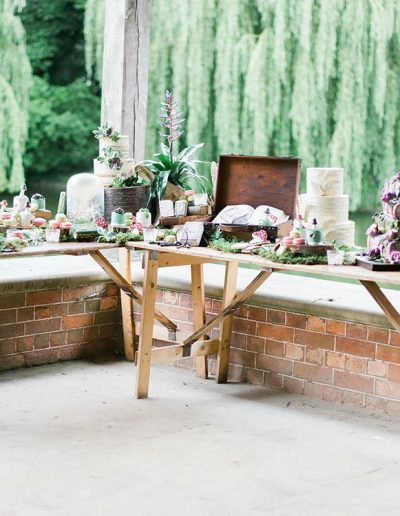 Adorning the dessert stall, a plethora of curiosities, moss and succulents were styled to continue the romantic woodland design. 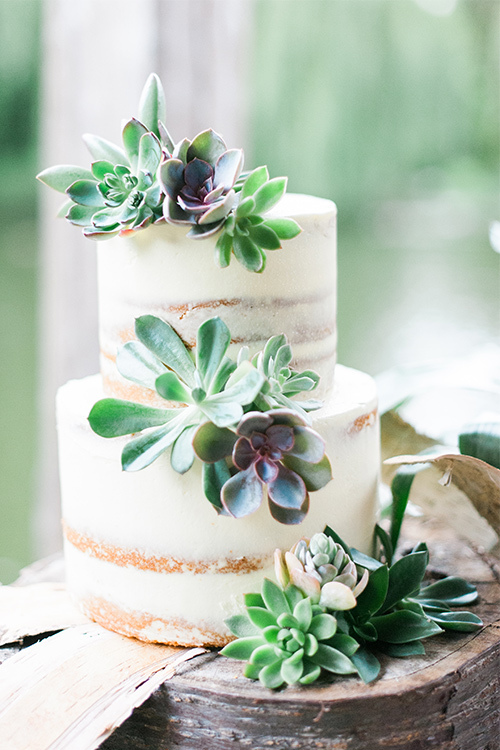 Four cakes were created for our dessert table to demonstrate the different ways one could have their wedding cake to fit this style. 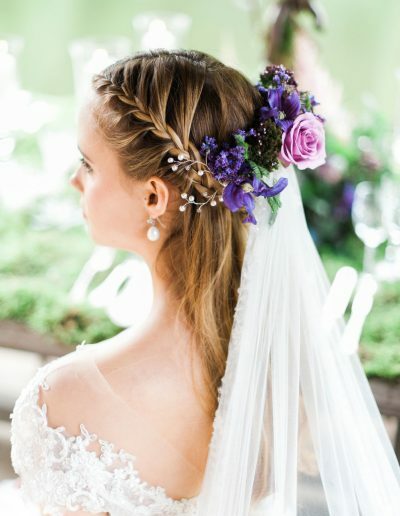 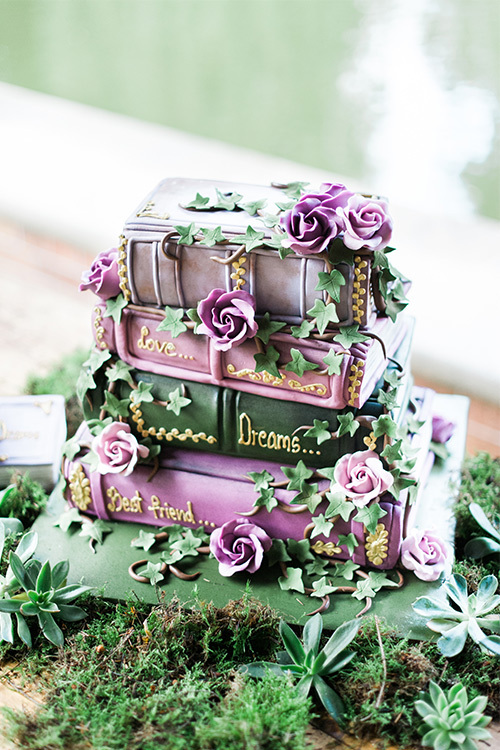 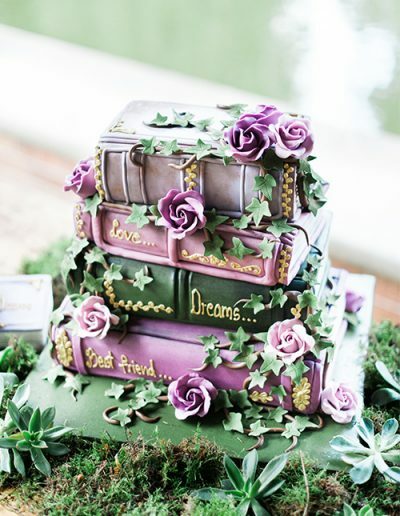 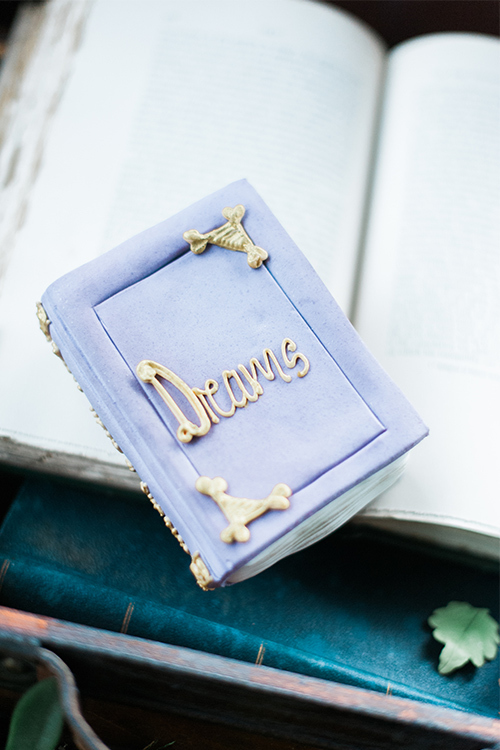 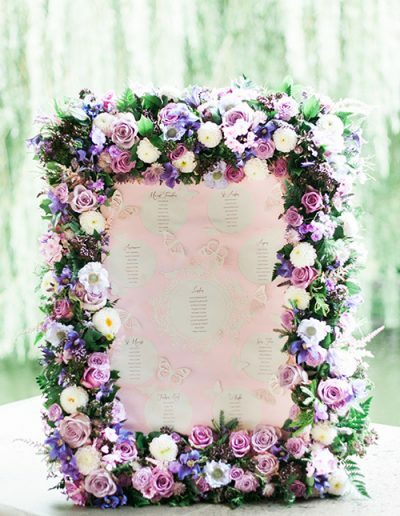 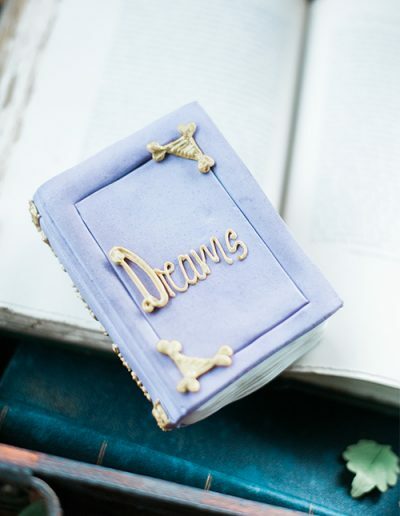 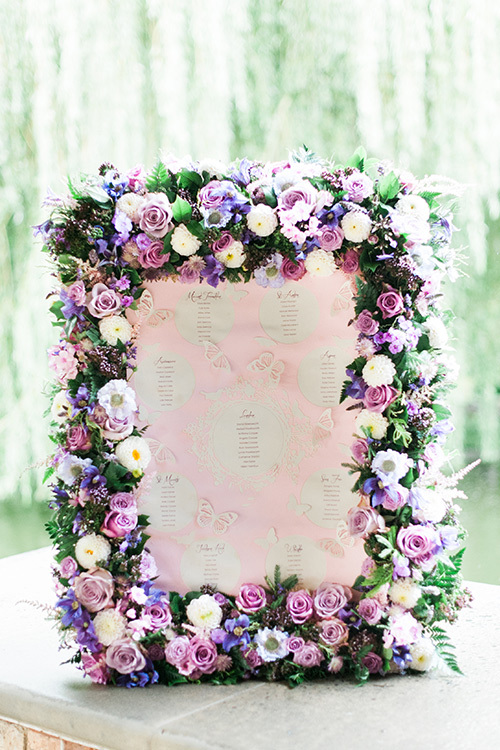 The first was the enchanted fairytale book decked in purple roses. 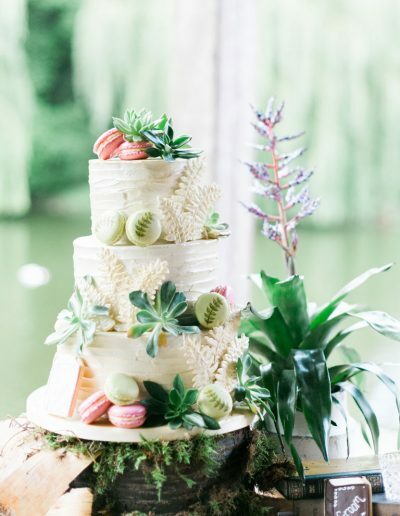 The second cake was two tiered with the bottom tier styled as a bark effect and decorated with sugar pine cones. 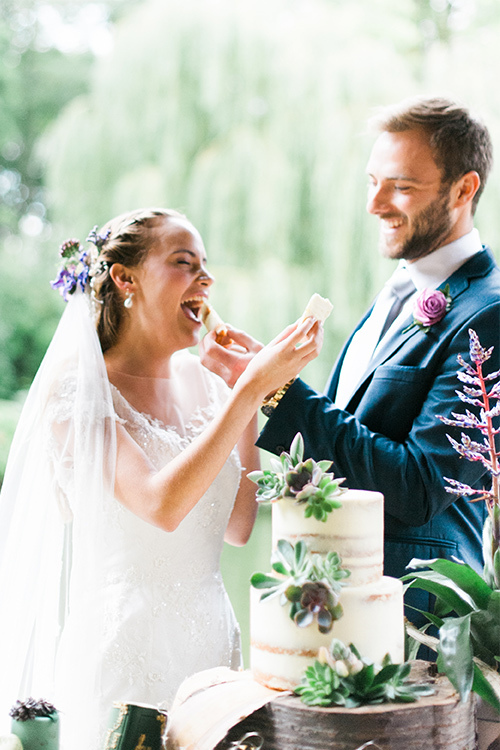 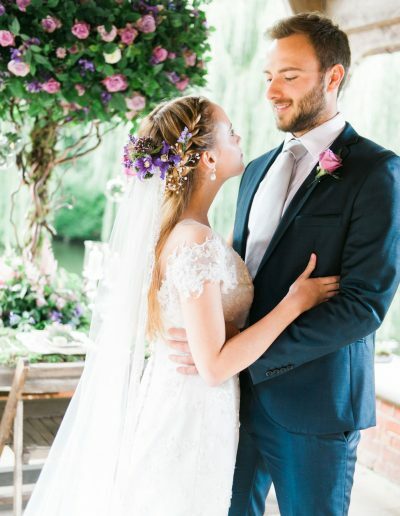 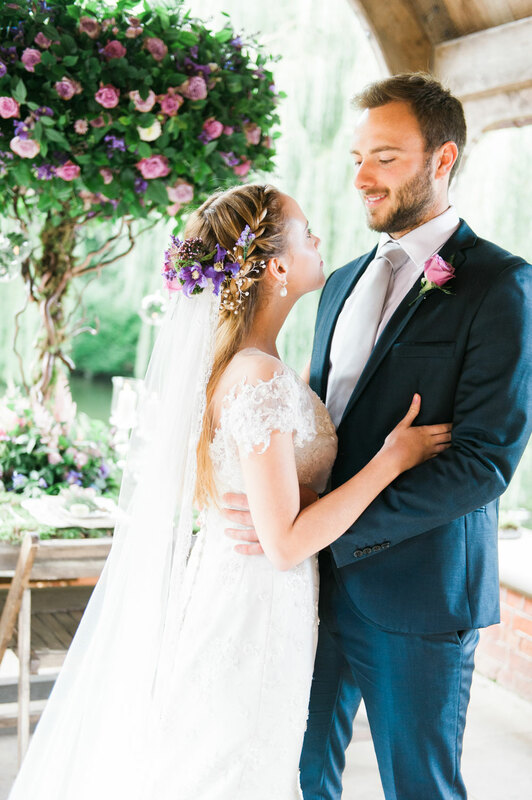 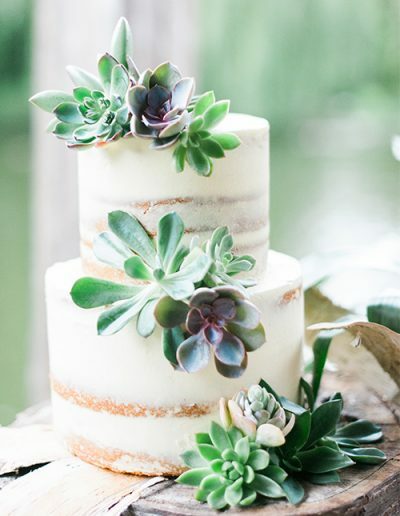 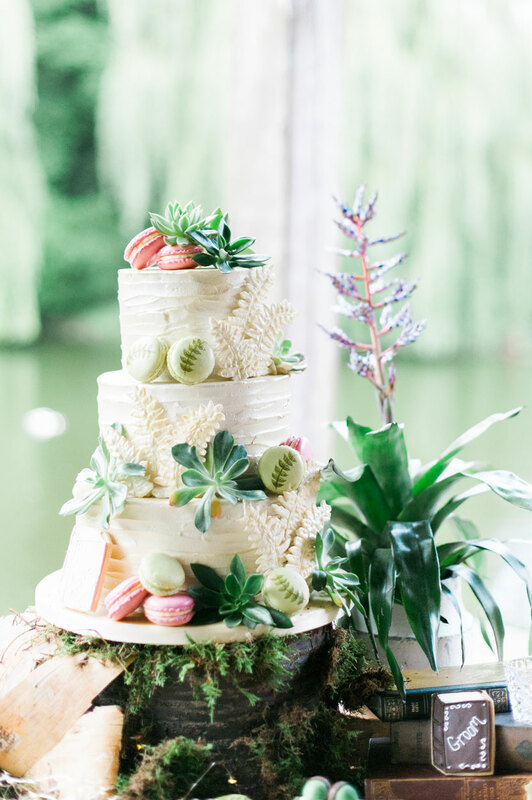 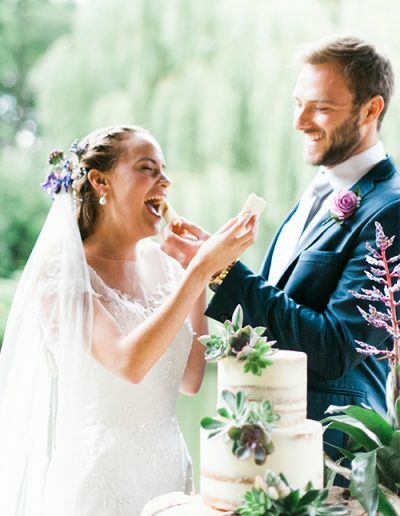 We wanted to bring in elements of nature, which worked well with the third gold cake piped with ferns and the stunning real succulents on the fourth semi-naked cake. 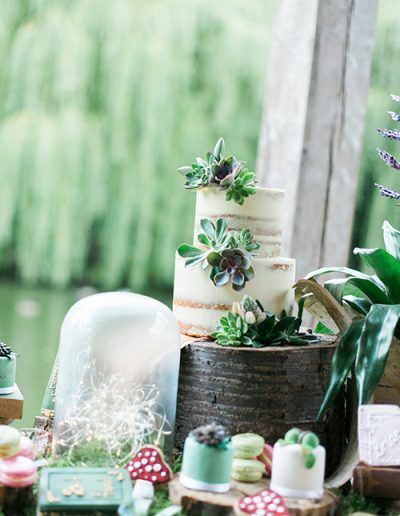 The fairytale elements came in with the toadstool cookies with bright pops of colour amongst the moss and bark styling. 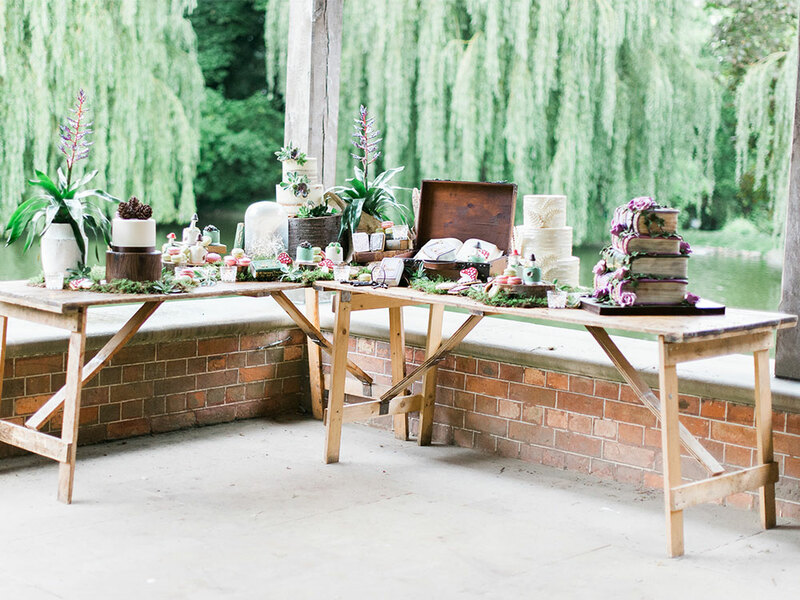 Individual miniature cakes adorned with sugar acorns, more pinecones and toadstools added to this abundance.